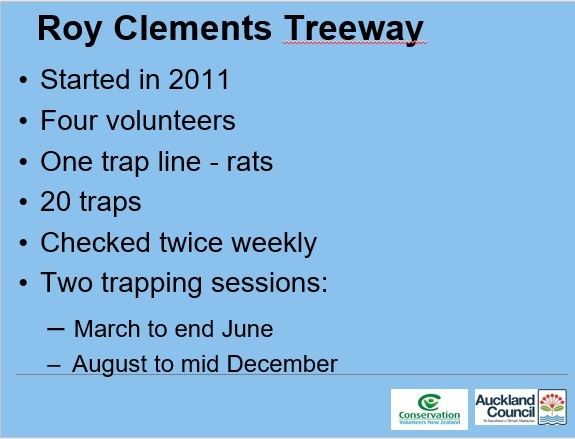 Above is a summary from a Council presentation outlining the pest management approach. Two volunteers resigned and were replaced so we still have a total of four. A training session (July 2016) was held at RCT in order to fill the gap in the volunteer numbers. 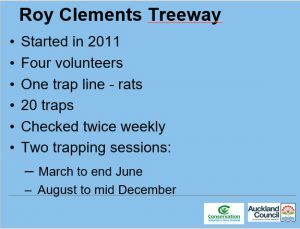 Results from the last two trapping sessions (August to mid December 2016 and March to June 2017) are shown below. The numbers may be a slight underestimate as there’s no guarantee that volunteers always record all their catches. The latest animal pest monitoring results showed a drop in tracking indices. Notwithstanding that it’s difficult to obtain accurate monitoring data in small urban reserves such as RCT, it’s still encouraging to see such results.